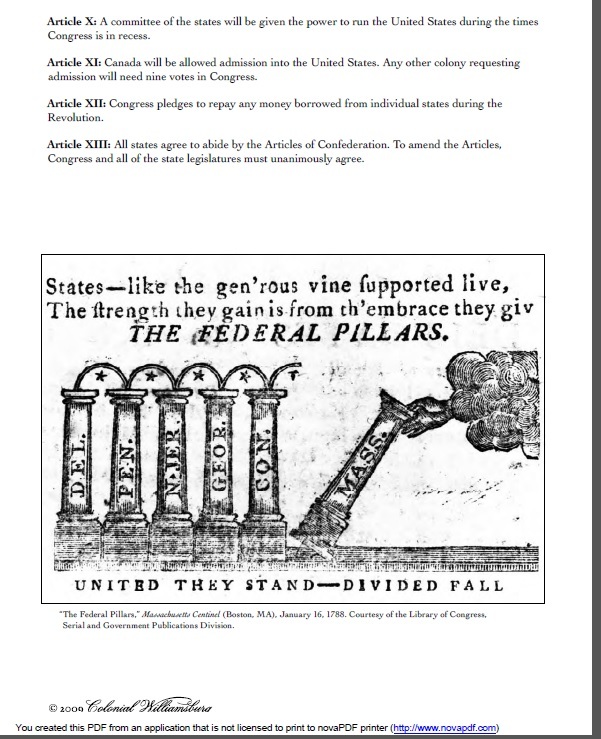 This year, since I am gameless, I ended up creating new lesson that had my students examining the Articles of Confederation. The lesson could work for any class, but might need some scaffolding for students who struggle with reading. I think it is a decent lesson, but I also am sure there is someone out there doing something different that is probably way better. I began the lesson by going through our usual warm up/objective routine and asked them to name the elements/qualities of what a good government would possess. We discussed these different elements for a few minutes and the students came up with many different responses, such as maintaining order, hearing the people, allowing democratic processes, and providing for the common defense. 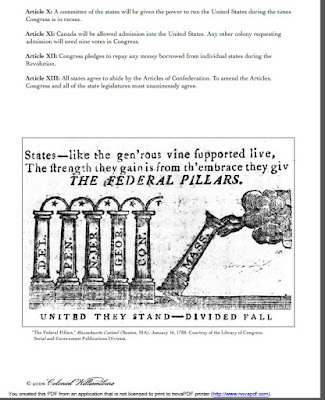 This really got the ball rolling and I then introduced the fact we were going to talk about the first document that governed the behavior of the United States Government. I wanted them to think about what elements made up a good government so when we juxtaposed it up against the Articles they could see how far the document fell short. I then gave the students the definition of a confederation on our promethean boards and discussed the meaning. I used this as the definition: Confederation: A Loose alliance of states mostly for common defense. Usually, the National government has less power than the State governments. The next step was having the students look at a version of the Articles that was student friendly that I found from a packet created by Colonial Williamsburg. 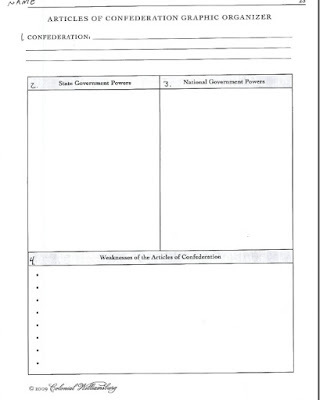 From there I had the students use the organizer to write down the roles/powers that the national and state governments had been delegated in table groups they worked for about fifteen minutes examining the document and writing things down while I moved around the room answering questions about syntax and vocabulary. 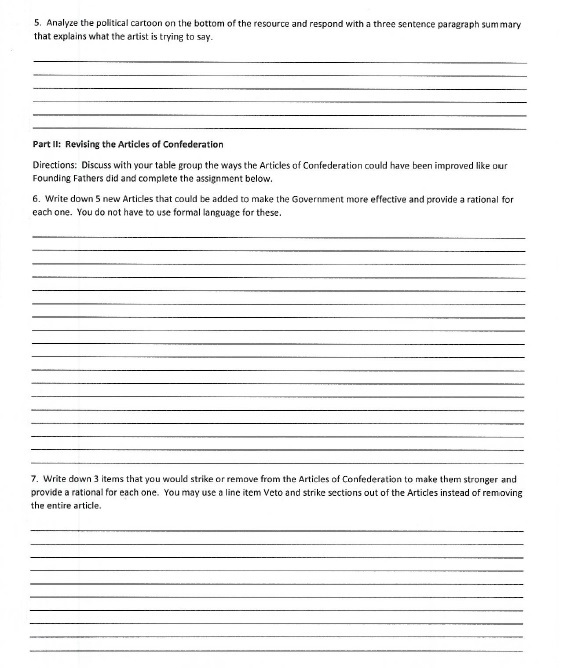 The students began having discussions about some of the issues the things they were reading was going to cause and how there were some interesting articles that seemed to have very little to governing the nation, such as the Article about allowing the Canadians become a part of the USA. 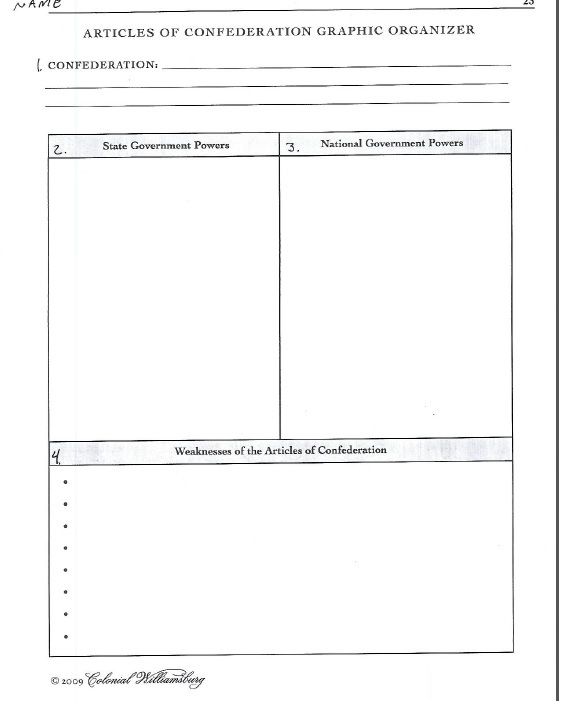 Once the students made it through the first two sections on the organizer, I then asked them to come up with problems the government might face. They had difficulty with this so I ended up putting the weaknesses and the problems they were going to face on the board to help them. Once I did this they seemed to grasp the concept much more. I then had them analyze the primary source cartoon in their table groups on the US states standing together. They referenced the symbolism and grasped the concept in a different way that if the states were not united they could have fallen one my one, which would cause the entire thing to fall apart. We also discussed how the Founding Fathers were desperately attempting to keep the nation unified to maintain a level of strength, but also were terrified about the US government becoming tyrannical. 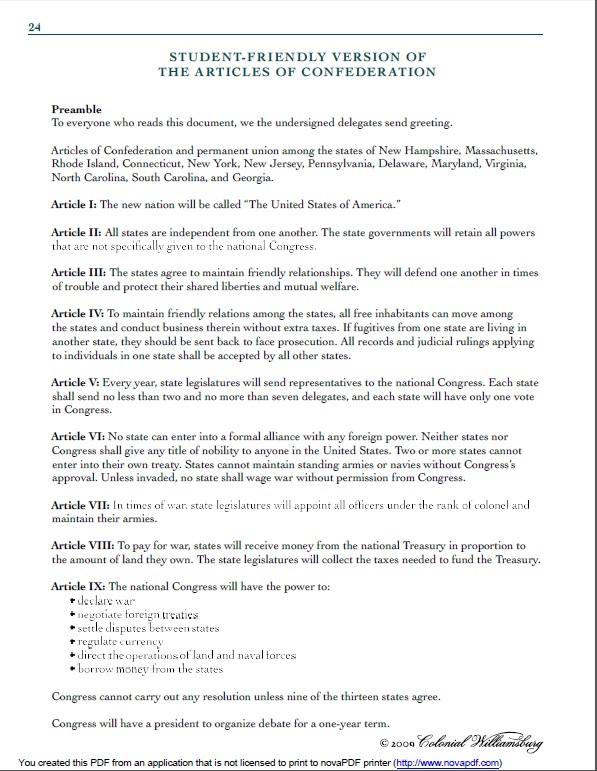 For the final part, I had the students put themselves in the shoes of the founding fathers who would have been tasked with correcting the Articles of Confederation. I tasked them in table groups to come up with five items that they would like to add to make the articles stronger and more effective. I also asked them to come up with three things they would remove entirely. 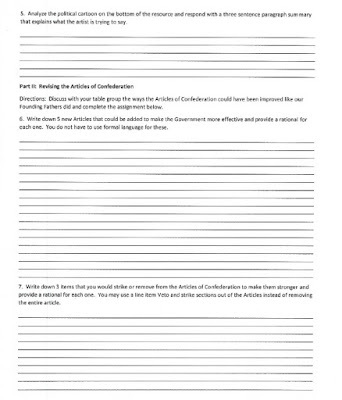 I also had the students write down a rationale for what they added and what they struck from the original document. A lot of what they came up with is things that we have in the constitution and also referenced the weaknesses in the Articles. 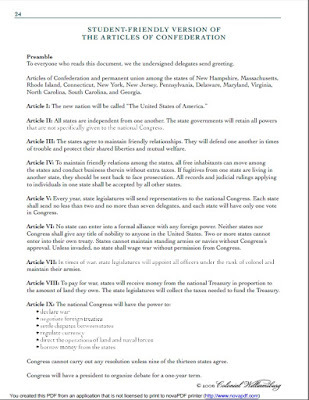 The students used the remainder of the period to complete this discussion. So, this is what I did this year. 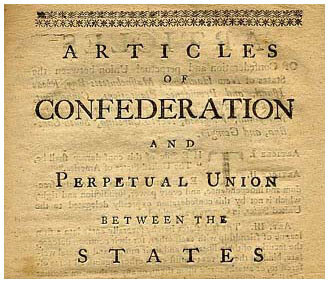 What do you use to teach the Articles of Confederation? I’d love to hear your ideas!